A student of yoga that I work with privately wrote a blog post about our sessions and the benefits of private yoga lessons! For the past few weeks I've been taking a private yoga lesson about every other week with a woman named Natalie, who is also one of the instructors that teaches at Maile's studio. While I assumed I would enjoy the private lessons, I've actually come to find them far more valuable than I was expecting, and have come to believe private yoga lessons are something that more people would benefit from. I wanted to write a bit about why I've found the private instruction valuable, why other yogi's might want to consider adding the occasional private lesson into their practice and hopefully provide something that will help instructors begin the conversation with their students about why they might be interested in a private. The first thing I'll note is that I was actually a bit surprised at the cost for a private yoga lesson. At about $100 to $125 per hour, a private yoga class often costs about as much as a "regular" massage or Thai Massage. At first I thought to myself: "For a massage I can just lay there and someone massages me for an hour, but for a yoga class they're 'just' teaching me. And I have to do some work during a yoga class!" And for a group yoga class, a drop-in is usually somewhere around $15 or 20% of a private instruction. So my point is I was a little unclear as to why the cost was what it was. Now, after having a few private lessons under my belt I can clearly articulate why privates are valuable. Here's the thing: what you're paying for with private instruction is the attention of a trained professional to guide you through a series of breathing exercises, postures and adjustments, specifically tailored to your practice, your body, your needs and the specific things you want to accomplish with your practice. For some people that might mean working on inversions, for someone else it might mean getting the right adjustments for their lower back, while for another person it might mean being guided through a meditation to calm their anxiety. Instead of looking at a private yoga lesson as the multiplied cost of a group class, it's far more accurate to look at it as an opportunity for all the energy and expertise that a yoga instructor usually has to divide amongst a class of people, all directed at you. Often times you'll notice in class an instructor will ask about whether people want or don't want adjustments. After having a few privates with the same instructor, they start to understand your body and your needs in ways that they simply wouldn't be able to through only teaching you group instruction. The opportunity this affords you the student is that you get exactly what you want, and nothing you don't. It's interesting to note that of all the senses we have, how often we sometimes go without the sensation of touch by another person. Natalie commented to me once something that really stuck with me. She said something like: "You know for some people, a yoga class is the only time all day that they'll be touched by someone else in a kind way." I don't necessarily think a private yoga lesson is something you should get just because you want to be touched (I'm not sounding creepy right?) but I do think that adjustments and the touch by another human are indeed one of the many positive aspects of a private yoga class. Hands down, the weirdest thing about yoga to me is the way in which it can cause emotion to be released. I still remember coming home one time after a yoga class being completely confused, and told Maile that when I was in pigeon pose I started crying all of a sudden. Her response: "Oh yeah that happens sometimes!" A good instructor will make sure that your classes are a safe place for you, and if a burst of emotional release is something that your body generates, a private yoga lesson is a safe place for this to happen. The most surprising benefit of private yoga instruction for me is the compounding benefit that it seems to have had on my group class participation. It's really remarkable how being shown a few modifications in a private can have a cascading impact into your practice as a whole. I've witnessed this not just with myself, but also with Maile who has at times had privates to work on various things she wanted to focus on. The reason I write so passionately about the business of yoga is because I believe that the work instructors do is important and valuable. My experience with private instruction only makes me think moreso. It's clear to me now that private yoga instruction is one of the many opportunities the industry affords to both the student and the instructor, and I'm grateful I've had the opportunity to experience the benefits first hand. If you've been on the fence over scheduling a private, I say go for it. When Maile asked me to write a blog post about 'Restorative Yoga' my initial thought was that I wouldn't know where to begin. Restorative yoga and gentle practices take up a lot of space in my brain and my relationship with them runs deep. Restorative yoga has healed me in more ways that I can count. Physically, it was like finally locating the missing piece to a puzzle I had been working on for years. I grew up dancing and studied a pretty strict style of ballet. I remember when I was 16 begging my mom to let me get a 'sports massage' to help with my chronic shin splints and foot and knee pain. When I was in my training to become a yoga teacher I was working as a full time massage therapist, and had been one for a while. I worked in a busy spa in an international hotel downtown where we were booked 90 minute massage after 90 minute massage. By the time I made it to teacher training my body was overused, tired and it hurt. I would wake up in the morning with my arms and hands totally numb. There were days when I couldn't turn my head an inch in either direction. Committing to a regular yoga practice slowly started to heal and re-strengthen my body, but there were many days that I simply didn't have the energy or strength to do much more than child's pose. this is exactly what I need right now.During the class we were shown how to structure our props to support healing, long held poses. When we did any sort of movements they were slow and gentle. My body was much more receptive to the practice than my mind was at first. The mental practice of 'letting go' was a challenge at times (it still can be! ), and often my mind would get really chatty and loud the second I hit the bolster. Ironically, the longer we stayed in postures the easier it became for me to let go. Eventually, with a period of sustained and quiet physical stillness, the mind follows suit. After that first class I started to incorporate Restorative Yoga postures into my regular practice, and so they naturally made their way into the classes I taught as well. It is incredible to see how people respond to Restorative Yoga the first time they practice it. Often they express feeling surprised at the unexpected power of such a subtle practice.It can seem so counter-intuitive - doing less to inspire change. It is pretty magical though, what can happen when we slow down and get quiet. In the stillness of these powerful poses everything softens, and in this softness we become more receptive to physical, mental and spiritual evolution. The body slowly readjusts becoming more spacious. When the body is still the mind can relax, and when that happens a healing process begins. Restorative yoga is not flashy.In it's quiet simplicity it is nearly impossible to compete with oneself or others, and so it offers a retreat from the over stimulation we are bombarded with in daily life. If only for a short while there is an opportunity to feel free from expectations, pressure, competition and comparison. There is even freedom from effort since these poses are so self sufficient. To gain the benefits of a Restorative practice, all that is asked of us is to show up, become still, and practice letting go. I have experienced a significant amount of physical discomfort in my life. I was a dancer from a very young age, and did so very consistently up into my teen years. Dance is a gorgeous art form, and does not come without it's sacrifices. For me a lot of that was physical. Painful shin splints, sharp shooting pain in the arches of my feet, and sacroilial joint problems in my low back all started in my pre-teen years. At least twice a year for many years I would wake up unable to move my neck accompanied with the kind of pain that would make tears stream down my face. I begged my mom for my first massage at 16 not because I wanted to feel fancy, but because I wanted to feel better. Flash forward to the yoga years......When I really started devoting myself and getting serious about my practice, I began to pay attention to the conversations my fellow yogis were having. One thing that stuck out was hearing about peoples practices and the categories their practices could be placed in. You would hear things like, 'he has a really strong inversion practice.' or, 'she is a really backbendy yogi.' and naturally I quietly wondered what category I fell in or would fall in some day. As though this in some way would solidify my seat in the yogic community or make me complete somehow. Me and my 'strong/open/impressive (insert body part or posture here)' would be in our corner representin' and rockin' it. Thankfully the practice is much more powerful than my ego. Regardless of the insecurity I initially brought to my mat I kept showing up and learned to remind myself every time that I was perfectly imperfect and OK just as I was-even if I didn't believe it. No matter how stressed out I was that day, no matter how happy or sad, how stuffy my nose, or achey my hamstrings, everything was as it needed to be, and I was complete. And very slowly the shift happened. Instead of wanting to be considered a 'backbendy' yogi I started wanting to practice backbends that made me feel alive, healthy and open. Instead of the goal simply being a 'strong arm balance/inversion practice', I wanted a practice that would allow me to gain access to healthy and supported shoulders while helping me to feel confident and trusting of my body. Instead of pressuring myself to show up to my meditation cushion at least twice a day for an hour each sit because I knew someone else who did it, I invited myself to practice in a way that allowed me to be centered, and to know that I was doing enough. Enough. That is what it all came down to. That is what I wanted, for myself, my practice to be. Enough backbends to have a healthy back and open heart. Enough forward folds to feel good in my hips, legs and knees. Enough arm balances and inversions to feel light, happy, strong and balanced. Enough meditation to be ready as an active and present part of my life. I try to remind myself of all of this every time I step on my mat. I tell myself that I am complete. The beautiful result to all of this is that moving in a way that invites just enough has brought me to a place where I am almost completely pain free. Besides a few aches from life in general and riding my bike, I feel good. I don't wake up with both of my hands numb and tingling. I don't remember the last time I woke up unable to move my neck - It has probably been almost five years! This practice really is powerful. Most of the time, we just need to get out of the way and let the magic unfold on it's own. There are still times when I need to be reminded of this, and that is when I walk into a yoga class ready to be guided, supported and held. Ready to be reminded that I am complete. To feel it, to move with it and to breathe with it. My morning yoga practice today was to let my exhausted self wake up without an alarm. I woke up at 10am, and it felt great. 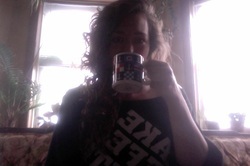 I am still in my pajamas drinking tea, and happy. The last few days, were so busy and filled with lots of vigorous yoga practice and a lot of teaching. I am so grateful for the day that it finally sunk in that an important part of a balanced yoga practice is resting. It is knowing when to slow down, taking a step back, and inviting oneself to do less. I have a tendency to be very hard on myself. I was, and if not careful, can be a 'pusher'. The kind of person who felt as though I was never doing enough, never good enough, and hurting myself while forcing things to be how I thought they should be. If I happened to actually get to that place wherever I thought I should be, I was not satisfied. I would be too focused and wrapped up in what was next, what was better, what was anything that where or who I was. Sometimes this 'pusher' side of my personality could be so overwhelming I wouldn't try at all, or I would pretend that I didn't care. Rarely satisfied, and completely motivated by self will, I didn't allow for the space to see all the beauty and gifts of the present moment. Competition with anyone, especially ourselves is so painful and destructive. It robs us of the only thing that truly matters, this moment, the here and now. Ironically, it is when we allow ourselves space, stop obsessing/thinking about ourselves, act out of kindness and love that all we are pushing for is able to fall into place as it should. It is not that we should stop trying, or stop showing up. Trying, practicing, and working hard are definitely necessary. But I learned for myself that there needs to be a neutrality, and a softness present. I try to practice watching closely the thoughts that flow through my mind, and the signals my body sends out. When I practice asana(yoga postures) I regularly remind myself that the end result isn't important because it isn't reality. Instead, I ask questions. What is happening in this moment? What am I feeling here? And then from there I can discern if I need to back off, stop for now, try again, or move on. That moment is my reality, and in that moment everything is exactly as it should be. If I listen to and honor the present moment, all of those things I would have been pushing for have a chance to happen, gracefully, eventually. Along the way I get the chance to live, feel, and learn....and enjoy my morning tea. Peace, you guys! A mindful practice is all about balance, right? And ahimsa (non-violence). Using our practices and healthy choices as a way to punish or stress ourselves to the point where we aren't even enjoying the practices anymore is not ahimsa. I have seen yogis get into heated arguments over whether their smoothies are healthy or not for crying out loud. I have read blogs claiming that 'Your smootie is making you fat!' and about gluten filled with self-riteous and sardonic vocabulary. When I was in Costa Rica my friends told me to 'eat without shame!' Hearing that was like music to my ears. As someone who has had lifelong battles with body image, and eating disorders, the declaration that we should eat without shame was powerful. I have heard some of my favorite teachers (shout out to Pandit Rajmani Tigunait and Gary Kraftsow) straight up say, 'eat your ice cream' and 'ahimsa does not mean vegetarianism'. What works for one person will not necessarily work for another. Put down the blogs, the fad diets, and cleanses and turn inward. Call on that awesome yogic tool of Pratyahara, withdrawal of the senses, and ask YOUR body what it wants. Get quiet, give yourself a much needed break from the maelstrom of dietary information (usually negative and anecdotal) that we are bombarded with daily. I don't know about you guys, but I am going to choose to listen to my own body. I want to understand my own special needs. And MOST importantly, I want to eat without shame! Remember that food is a gift, not a burden. Hey there, guess what? I don't practice vigorous asana everyday. *GASP* It's true. I am a yoga teacher, and I don't practice deep backbends, inversions and challenging arm balances every single day. Why? Well, because on certain days (considering the time of month, the season, my massage workload...etc) my body, mind and spirit does not benefit from (or I simply cannot 'do') a vigorous asana practice. But there is something that I always benefit from: taking time to be conscious with my breath. Pranayama is a sanskrit word that means, 'extension of the life force'. It is one of eight limbs that comprise the complete practice of yoga. Along with the extension and movement of life force/vital energy and all that other fancy stuff, pranayama at it's most basic helps the mind and body to feel good. And by good I mean, less anxious, calm, peaceful...which is enough reason to carve out some time to practice. There are a whole lot of exercises available for us that help to guide the breath and prana (aka life force) into certain energetic regions of the body, as well as the whole body. If you are new to pranayama I suggest starting gentle and slow. Start at the beginning. Practice, Sama Vritti aka 'equal parts breath' to experience a deeper connection to the breath as it moves through your body. Sitting comfortably on a chair or cushion with your eyes closed, gently guide your breath, so that your inhales mirror your exhales in texture and length. Using a count is helpful, and I suggest beginning with a steady paced count of four. After you have practiced for a while, and if it feels comfortable you can begin to increase the length of your inhales and exhales. As you continue on your yogic journey you will find many other pranayama practices with different purposes and benefits. 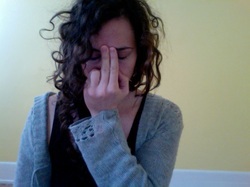 In my picture, I am practicing Nadi Shodhana, or, 'alternate nostril breathing'. Nadi Shodhana gives us direct access to the Third Eye, or first chakra-the 'command center'. It harmonizes the right and left hemispheres of the brain, and purifies and balances the nadis, or subtle energy channels in the body. As is a common result with many a pranayama practice, Nadi Shodhana grants a calm and centered mind. Taking time each day to be conscious of the breath whether that means controlling how you are breathing or simply allowing it to remain gentle and unaltered as you observe it is a pretty awesome gift you can give to yourself every day. Start small, be gentle and be kind. Bring more oxygen into the body, and thus bring in more peace. I know this might seem like the wrong time of year for a jar of raw masala oatmeal. It's October. It is time for chili, stews, roasted root vegetables and warm oatmeal. But regardless of the month, it was 77 degrees in Chicago today. Eating this on my porch this morning felt so right. This recipe is somewhat of a collaberation. I got the idea of eating my oats uncooked from my Grammy who sprinkles them on her cereal in the morning. I started making cereal with just oats, putting it in a container and taking it to work. I noticed that when the oats set in almond or rice milk, my breakfast would take on a whole new awesome texture. When I jazzed it up with dried fruit and nuts it became pretty decadent. Recently my friend and fellow yoga teacher Katie mentioned that she was putting Masala Chai spices in her raw oats (apparently eating oats raw happens outside of my family), and my friend and co-worker Karla who also is hip to the raw oats told me she puts chia seeds in hers. So what follows is a medley of all of our oat efforts, and it is awesome. Super filling, you could probably just eat half the jar and save the rest for the next morning. Place the lid on your jar. Roll and shake to combine spices evenly. ~After your oats and spices are all mixed up add enough milk to cover your oats, and stir in some raw organic honey. Place in the fridge covered overnight, give it another good stir, and top with bananas: YUM! going to be much of a blogger, but c'mon how could i not share this deliciousness? I adapted this recipe from one I saw last year, and I must say, it is pretty amazing. Warming, spicy and a little sweet, it is a perfect way to work tumeric and all of it's anti-inflammetory benefits into your day. Adding to that are ginger, cinnamon and honey. I have an incredibly delicate stomach, so this drink is great for keeping me feeling tip-top. Place all ingredients in your blender and give it a good whip. Transfer to a saucepan and heat on medium until hot-watch the broth turn a deep gold! So pretty. Place liquid back into blender and give another good whip. Please be mindful of blending your hot liquids-place a hand over the lid of your blender as not to douse your kitchen with your latte. I speak from experience of course. Pour your latte into a mug, and use a spoon to scoop your foam from the bottom of your blender to the top of your drink. Add a sprinkling of cinnamon because it looks nice. Sip and be warm and well.